Randy Shaw, Director of the Tenderloin Housing Clinic, discusses his compelling new book, Generation Priced Out: Who Gets to Live in the New Urban America. Generation Priced Out is a call to action on one of the most talked-about issues of our time: how skyrocketing rents and home values are pricing the working and middle classes out of urban America. From San Francisco to New York, Seattle to Denver, and Los Angeles to Austin, Generation Priced Out tells the stories of tenants, developers, politicians, homeowner groups, and housing activists from over a dozen cities impacted by the national housing crisis and criticizes cities for advancing policies that increase economic and racial inequality. Randy Shaw exposes how boomer homeowners restrict millennials' access to housing in big cities, a generational divide that increasingly dominates city politics. Defying conventional wisdom, Shaw demonstrates that neighborhood gentrification is not inevitable and presents proven measures for cities to preserve and expand their working- and middle-class populations and achieve more equitable and inclusive outcomes. 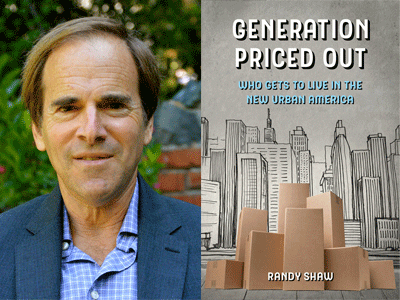 Generation Priced Out is a must-read for anyone concerned about the future of urban America.